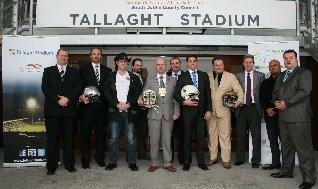 The 2013 EFAF Atlantic Cup, which is being played in the 8,000 capacity Tallaght Stadium as part of The Gathering Dublin, was formally launched on Saturday 12th January. The tournament will take place over the weekend of 29th/30th June 2013. Irish Champions Belfast Trojans will be joined by Brussels Tigers (Belgium), Dudelange Steelers (Luxembourg) and a team from The Netherlands – which will be confirmed by the Dutch Federation soon. The EFAF Atlantic Cup is the official Western European Championship for amateur American football teams. It is possibly the most exciting tournament on the International American football calendar given that the participating teams are very closely matched in terms of their standard of play. In recent years, a very high percentage of games have been decided by very narrow margins. 12:00 Belfast Trojans v Dudelange Steelers 15:00 Brussels Tigers v Netherlands Team. To assist both teams and supporters, South Dublin Tourism has put together some special packages deals for those attending the EFAF Atlantic Cup. These packages include accommodation, meals, airport transfers and stadium transfers. Details will be announced shortly. - the supporters packages will be open to all American football fans, not just those attached to the participating teams. The game will also be heavily marketed in the greater Dublin area with a view to generating a good crowd to add to the festival atmosphere. Ireland’s leading newspaper, The Irish Times, listed the The Gathering Dublin, including the American football games taking place in Tallaght Stadium in 2013, as being among the highlights of the 2013 festivities. The IAFA and Tallaght Stadium will also host a series of games involving visiting North American teams in late August. gatherings, festivals, special sporting events, music and concerts taking place all across the country, all year long. Communities throughout Ireland will showcase and share the very best of Irish culture, tradition, business, sport, fighting spirit and the uniquely Irish sense of fun. Owned and operated by South Dublin County Council,Tallaght Stadium first opened its doors to the public in March 2009. Overlooked by the Dublin Mountains, positioned right in the heart of South Dublin County, Tallaght’s boutique Stadium has quickly become a household name in Irish sport. This multipurpose 8,000 seater facility is home to League of Ireland soccer team Shamrock Rovers and is also Ireland’s premier American football venue.